Letterpress printed (vegetable ink) Eco + Recycled Holiday Card. 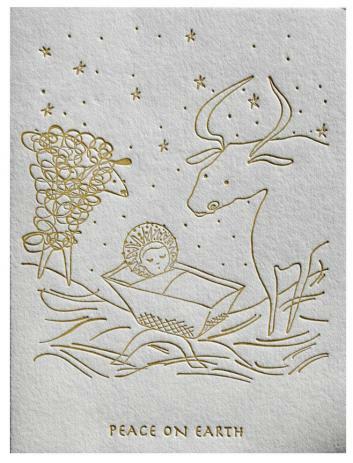 Card is made from 100% cotton cardstock. We print offset or you can write out your inside greeting by hand. Original artwork letterpress printed in gold vegetable based inks. We will print your greeting on the inside of the card by the offset printing process. We can also print your return address on the back flap of the mailing envelope. Overall Size: 4.25 x 5.5 inches folded. Scored fold at side. Mails in standard A2 recycled paper envelope. (50% recycled content). Handsome envelope.